DIN presents the European Commission with the "German Standardization Roadmap for Services". The Roadmap describes both the potentials and the limitations of services standardization, and identifies areas in which standardization has the most strategic significance for the German services sector, in the European context as well. On 13 January DIN officially opens its new modern conference centre and interactive exhibit, "NormenWerk". DIN intensifies its long-standing good relations with SAC (Standardization Administration of the People's Republic of China), the Chinese member of ISO, by opening its own office in Beijing. Current topics include "smart cities"; DIN presents the new "Smart City Standardization Roadmap". The project "Standardization 18.0" is initiated. The goal: To reduce standards development time even further to 18 months for all deliverables, with a zero error rate. DIN's new corporate design is awarded the German Design Award. The DIN SPEC methodology and DIN's terminology portal "DIN-TERM" also win prizes. The European regulation on standardization, Regulation 1025/2012, takes effect on 1 January. The aim of the Regulation is to increase the competitive ability of European businesses. DIN invites representatives from German industry, research, standardization and politics to a workshop to discuss the role of standardization in the upcoming transatlantic free trade agreement. The purpose of the workshop is to formulate the national standpoint. In October the results are further discussed at a conference organized by DIN and the American standards organization ANSI. The "German Standardization Roadmap on Industry 4.0" is published. DIN expands its work on other deliverables such as the DIN SPEC. The development of a DIN SPEC is especially suitable for highly innovative topics and helps accelerate the transfer of knowledge and technology. The business strategy "KITE" (for convergent (Konvergent, in German), innovative, topics, development (Entwickeln, in German)) is initiated. DIN's Statutes are revised. One modification is the explicit encouragement of standards work in innovative areas. The DIN Prize for Innovation is awarded for the first time at the Hanover Fair. In addition, two young scientists receive the special "Science" prize for their doctoral dissertations dealing with standardization in depth. The "DIN-TERMinology portal" goes live. DIN opens an office in Brussels in July to effectively represent the interests of German industry in European standardization policy-making. The plaza in front of DIN's Berlin offices is officially named the "DIN-Platz". The first of the "studiFORUM" events series is held in May. "studiFORUM" is a platform where students meet representatives from German industry to gain insight into innovative and business-oriented topics, discuss questions with various experts, and make valuable contacts with top experts. 2010 The "Updated German Standardization Strategy" is published. DIN's Electromobility Office is set up. DIN's Civil Security Coordination Office (KoSi) is set up. 2009 Shorter innovation cycles, converging technologies, global competition, and a demand for market relevance present new challenges for DIN. In this light, deliverables that do not require full consensus and can be developed quicker gain importance. A new standardization concept is introduced by which all documents that do not require full consensus are published as DIN Specifications, or "DIN SPEC". The first document of this type, DIN SPEC 1086 "Quality standards for controlling", is published. 2008 The Berlin Institute of Technology (TU Berlin) and DIN sign a cooperation agreement outlining their future cooperation as strategic partners in research and higher education. 2007 Michael Glos, Federal Minister of Economics and Technology, and Günter Verheugen, Vice President of the European Commission, are keynote speakers at the European Conference "Innovation and Market Access through Standards" held on 27 March in Berlin. The conference was organized by DIN within the context of the German EU Presidency. The relocation of standards committees from Cologne to Berlin – part of a strategic centralization of DIN's standardization activities - is completed. DIN celebrates its 90th anniversary with a colloquium and the opening of the multimedia exhibition "NormenWerk" in DIN's Berlin offices. 2006 DIN is cooperation partner of "Germany – Land of Ideas", an initiative sponsored by German Federal President Horst Köhler. DIN is designated one of 365 "landmarks". In May the first of the "Innovation with Norms and Standards" projects are started, launching this long-term program initiated by the Federal Ministry for Economics and Technology and coordinated by DIN. DIN holds an "Open House" to celebrate World Standards Day on 14 October, displaying examples of its cooperation with numerous companies and organizations in a wide variety of sectors. 2005 On June 10 DIN hosts a colloquium titled "30 years of successful partnership - A model of success, in Germany and beyond" to mark the 30th anniversary of the standards agreement between DIN and the German Federal Government. In July the Presidial Committee "FOCUS-ICT" is founded. Its aim is to implement the German Standardization Strategy, particularly Goal 1, using standardization's potential to "secure Germany's position as a leading industrial nation". In November the first DIN Prize "Young Science" for students is awarded. 2004 "Standardization in Germany helps business and society strengthen, develop and open up regional and global markets". This is the vision agreed upon by representatives from all stakeholders in standardization in Germany and detailed in five strategic goals. The publication of the German Standardization Strategy in December 2004 represents a timely response from the German standardization system to the ever increasing demands from the globalization of markets, the increasing convergence of technologies, and the dynamic changes in its environment. On 2 November, during a ceremony in honour of World Standards Day, DIN awards its first DIN Prize "Best Practice" for the best example of how standards are incorporated into company procedures. 2001 On 6 November the first DIN Prize "Benefits of Standardization" is awarded. The winner, Jürgen Herther, receives € 15,000 for his description of a system of multi-purpose small load carriers used in the automotive industry. 2000 DIN's new service providing online downloads of standards and other documents is given its official start at the EXPO in Hanover. More than 45,000 technical rules are now available online 24/7. A research project initiated by DIN together with the German Federal Ministry of the Economy on the "Economic Benefits of Standardization" is completed. The results of the study confirm that standards bring an overall benefit to the German economy of approximately 30 billion DM per year. 1999 On 15 March Dr. Torsten Bahke is named Director of DIN. DIN's new building, the Alexander-von-Humboldt-Haus on Budapester Straße in Berlin, is inaugurated. 1998 The first German Publicly Available Specification (PAS) is published. This new deliverable is intended to fill the gap between full consensus-based standards and company standards. 1996 DIN and Beuth Verlag launch their first websites. As from October all Beuth publications, DIN Standards and VDI Guidelines can be searched and ordered online. 1992 The third extension of DIN's Berlin offices on Burggrafenstraße is completed. DIN's 75th anniversary is celebrated in the Berlin historic concert hall "Schauspielhaus". The Austrian Standards Institute (ON) and the Swiss Association for Standardization (SNV) become shareholders of Beuth Verlag. Beuth's publishing activities now cover the entire German-speaking area. 1990 The "Office of Standardization, Metrology and Commodity Testing (ASMW)" of the GDR ends its work after the reunification of Germany. The use of DIN Standards is officially recommended. DIN takes on more than 100 ASMW staff members. 1989 DIN and GOST, the Soviet standards body, sign a cooperation agreement. 1985 Introduction of the "New Approach" to European standardization (i.e. legislation refers to standards for technical details) with a view to speeding up the completion of the European internal market. 1983 DIN's Environmental Protection Helpdesk set up. 1979 Cooperation agreement between DIN and the Chinese standards body, SAC, signed. 1975 DIN and the German Federal Government sign an agreement by which DIN is recognized as the national standards body for Germany. The name "German Committee for Standardization" is changed to the "German Institute for Standardization, or "DIN" for short. 1974 DIN's Consumer Council founded, taking up its work on 1 January 1975. 1972 The "German Society for Product Marking" (now DIN CERTCO) founded within DIN to ensure all of DIN's certification activities are carried out according to uniform principles. 1970 Together, DIN and VDE Association for Electrical, Electronic & Information Technologies form the DKE German Commission for Electrical, Electronic & Information Technologies of DIN and VDE, which is the German body responsible for the electrical engineering, electronics and information technology sectors. 1965 Foundation laid for the "House of standardization" on Burggrafenstraße, DIN's headquarters in Berlin. 1961 DIN is a founding member of the European Committee for Standardization (CEN). The East German government closes DIN's offices in East Berlin, Jena and Ilmenau. 1954 The "Office of Standardization" of the GDR is founded. Its President or his representative functions as a Vice President of DIN. 1951 DIN becomes a member of the International Organization for Standardization (ISO), gaining status as the "sole national standards organization for Germany". 1948 DIN's Presidial Board is constituted on 2 December. 1946 The Allied Control Council permits DIN to resume its work, representing all of Germany. 1943 The DIN offices in the centre of Berlin are destroyed in an air-raid on 23 November. 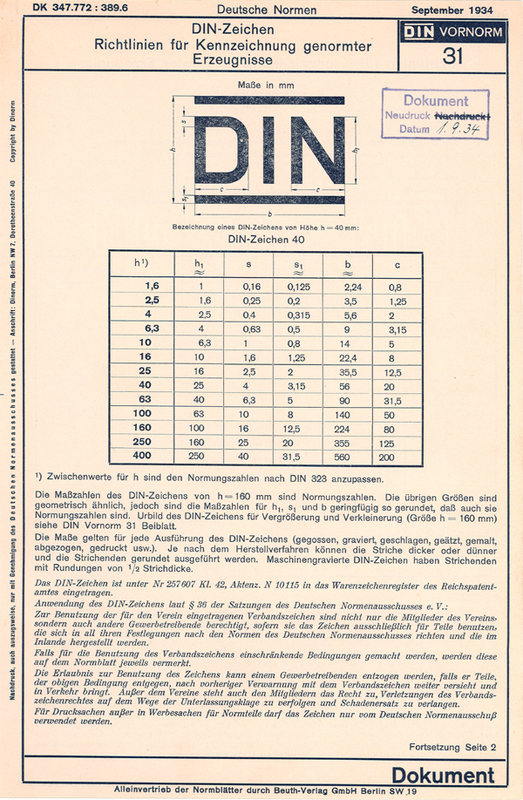 1934 Early version of the DIN mark established for the first time in DIN 31. 1933 Beuth Verlag avoids being absorbed into the Reichsschrifttumskammer (Reich Literature Chamber) by renaming itself "Beuth Distributors" rather than "Beuth Publishers". 1927 The 3000th DIN Standard is published. The first edition of the monthly journal "DIN-Mitteilungen" appears in January. 1926 DIN changes its name to "Deutscher Normenausschuss (DNA)" (German Committee for Standardization). 1924 Beuth Verlag is founded as a publishing company, its primary objective being the sale and distribution of DIN Standards. 1922 DIN 476 "Paper formats" (DIN A 4 etc.) is published. 1920 DIN is registered in Berlin as a non-profit association. The DIN mark is registered with the patent office as a trademark. 1918 In March, the first German Standard is published (DIN 1 "Taper pins"). 1917 DIN is established on 22 December as the "Normenausschuss der deutschen Industrie (NADI)" (Standards Association of German Industry) - this name was changed in 1926 and, most recently, in 1975.